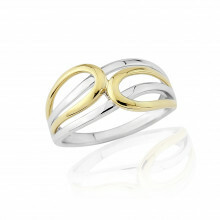 Two uneven oval loops - one in Yellow Gold, the other in White - fixed together in a quirky design. Unusual and beautiful studs with an open design and a post and butterfly fitting. Quirky and cute everyday Earrings.